A court in Ivano-Frankivsk has remanded controversial blogger Ruslan Kotsaba in custody for 2 months. While journalists are among those condemning Kotsaba’s public pronouncements and actions, his detention and the charges against him – of treason and of obstructing the work of the armed forces – have met with criticism. Kotsaba was detained by the SBU [Ukrainian Security Service] on Feb 7. He is suspected of crimes falling under Article 111 § 1 (state treason) and Article 114-1 § 1 (obstructing the lawful activities of the Armed Forces and other military formations). The SBU asserts that during the search of Kotsaba’s home, incriminating material which could fall under the above-mentioned articles, was removed. Detention was sought on the grounds that the charges did not envisage a less serious restraint measure. He asserts that “there are almost no regular Russian forces in Donbas” and that it is local guys who are killing other local guys. Kotsaba’s denial (“almost”!) of Russian involvement is not only rejected by the Ukrainian government, but by NATO and international observers, as well as Russian public figures and NGOs, like Soldiers’ Mothers of St Petersburg. Such utterances led to TV 112 immediately distancing themselves from Kotsaba, after he was publicly called one of their correspondents, and to some Ukrainian journalists feeling that Kotsaba is effectively working for Russia. 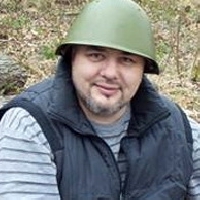 Yury Butusov, Chief Editor of Censor.net points out that “it’s hardly surprising that such a text from a person presenting himself as a military correspondent who has seen the truth in Donbas should have become a hit in the Russian media. The propaganda and treason was not his criticism of the government, but the fact that Kotsaba consciously decided to take part in an anti-Ukrainian campaign”. Butusov is scathing about Kotsaba’s assertion that there are “almost” no Russian soldiers in Donbas, and reels off all the details that Kotsaba chose to disregard. “When Hollande and Merkel decided to stop the civil war in Ukraine, they for some reason did not fly to Kyiv to campaign against mobilization. They flew to Moscow. And Ruslan Kotsaba needs to fight for peace on Red Square no less ferociously and consistently than in Ukraine, and should not forgot and should not lie about the supposed lack of Russian forces in Ukraine”. Butusov’s condemnation of Kotsaba’s utterances is shared by many Ukrainians, however concern has been expressed at the measures taken. Human rights activist Volodymyr Yavorsky is thoroughly opposed to the move. He says that he still has not understood what exactly Kotsaba is charged with, and believes there are no grounds for calling his statement illegal. He considers that there were no grounds for remanding Kotsaba in custody for two months. If the SBU found something indicating, for example, that Kotsaba is working for the Russian FSB, then they should have made a public statement to that effect. He is adamant that statements against mobilization fall within the right to freedom of speech. The Independent Media Union of Ukraine has also issued a statement which combines criticism of Kotsaba with concern about the dangerous precedent that this detention creates. “Mr Kotsaba very often oversteps the boundary line between professional activities and political activism. Whether consciously or not, he has publicized the claims of Russian propaganda which are in many cases based on false information. Whether freely or not he has helped to create a picture needed by the Kremlin which has little link with reality. His call to ignore mobilization is part of a whole information campaign which is clearly of an organized and coordinated nature”. On the other hand, no proof has been presented that Kotsaba was actually carrying out orders to carry out destructive information activities or that he was deliberately seeking to harm Ukraine’s information security. There is also no evidence of a cause and effect link between Kotsaba’s utterances and any avoidance of mobilization. “Despite all the questionable nature of Ruslan Kotsaba’s activities, criminal prosecution creates a precedent when any journalist or public activist will be accused of state treason for utterances which contradict the official position of the state authorities”. The Union believes that better grounds must be provided to warrant the charges laid. The charges in this case were brought by the SBU in response to a complaint lodged by an Ivano-Frankivsk civic activist Taras Demyaniv. His outrage is very widely shared, making it immensely difficult to view this case with detachment. On the other hand, a person is in detention over utterances, and however obnoxious they may be, the concerns expressed deserve to be heard. • Whose anti-Semitic and Homophobic Choice? • What should they talk about, Mr Putin? • EU’s Clear and Consistent Capitulation?